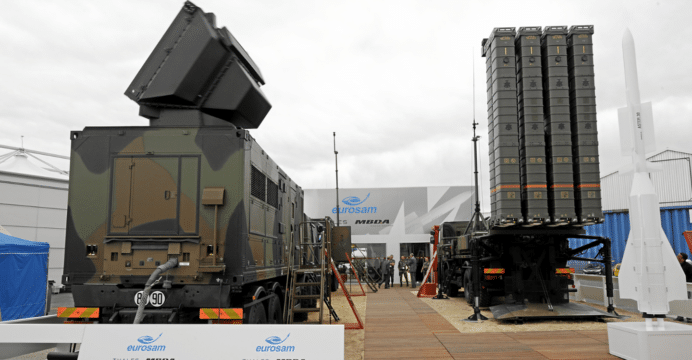 The French-Italian air defence consortium Eurosam has signed a “Heads of Agreement” (HoA) with Turkish defence companies Aselsan and Roketsan to fulfill the Turkish Undersecretariat of Defence Industries (SSM)’s call for a locally produced long-range air and missile defence system. The HoA was signed on July 14 in Ankara. Defense Aerospace reported that the “definition study” will be concluded within 24 months, after which Eurosam, Aselsan and Roketsan will proceed to develop a system for the Turkish Armed Forces (TSK). It is unclear if the TSK will also acquire Aster 30 SAMP/T (Surface-to-Air Missile Platform/Terrain) batteries off-the-shelf or if it will solely acquire the joint Eurosam, Aselsan and Roketsan system. Ankara is in late-stage talks with Moscow for the latter’s S-400 long-range surface-to-air missile (SAM) system. In 2015, Turkey had intended to close a $3.44 billion U.S. deal with China Precision Machinery Import Export Corp (CPMIEC) for the latter’s HQ-9 long-range SAM system. However, pressure from NATO pushed Ankara to walk away from that program and re-open its long-range SAM program for bids. In November 2015, the SSM tasked Aselsan and Roketsan to develop a homegrown solution. However, during 2016 Ankara had begun negotiating with Moscow and Western firms for air defence systems – the SSM and Turkey’s Ministry of Defence (MoD) opened talks with Eurosam in September 2016. Despite these engagements, the SSM had reiterated that a domestic long-range SAM system was still in the pipeline. It is apparent that this system will be developed in collaboration with Eurosam. Besides augmenting Turkey’s land-based air defence network, the new SAM system will also accompany the Turkish Navy’s future TF-2000 anti-air warfare (AAW) frigate. While this SAM will draw from the Aster-30, it is not known if it will be a copy or a derivative. The latter avenue could enable Turkey (and Eurosam) to examine new applications, such as quad-packing (like the Standard Missile series), among others.